// Show a simple alert window with the "Hello World!" text. In the example above, we created the <script> element, and put the jQuery callback function in it. The jQuery binds a function to be executed when the DOM has finished loading. When the function is executed, a simple alert window with the "Hello World!" text and OK button will appear. When the browser encounter such a <script> element, it reads the external JS file and executes the code. Script can be placed at the bottom of the <body> section of an HTML page, just before the closing </body> tag. This way is acceptable when you need the entire DOM14 to be loaded before the script can start executing. 14) The DOM (Document Object Model) is a convenient representation of an HTML document structure as a tree of elements. appendFile() Puts a link to external JS file after all others. offsetSetFile() Inserts a link to external JS file in a given list position. prependFile() Puts a link to external JS file before all others. setFile() Clears the list of scripts and puts the single external JS file in it. appendScript() Puts an inline script after all others. offsetSetScript() Inserts an inline script to a given list position. prependScript() Puts an inline script before all others. setScript() Clears the list of inline scripts and puts the single inline script in it. Other methods provided by HeadScript view helper (such as prependFile(), offsetSetFile() and setFile()) differentiate only in the position in the list of scripts into which the new script will be inserted. 15) The name InlineScript does not fully reflect the capabilities of this view helper. Actually, it can insert both inline and external scripts. The better name for this view helper would be BodyScript, because it is intended for inserting scripts in document body. 16) Heredoc is an alternative string definition method provided by PHP. It works well with multi-line strings. This ensures the same effect is achieved as with InlineScript view helper, but allows for better script readability and automatic syntax checking in NetBeans IDE. For HeadScript and InlineScript view helpers to work, you should ensure their content is echoed in layout view template (look at lines 23 and 62 of layout.phtml file). If you remove those lines from the layout template, the scripts won't be inserted in the web page. Download typeahead.min.js file (a minified version of the Typeahead library) from the official project page. When the download is finished, place the file in your APP_DIR/public/js directory. Then add the typeahead.phtml file in your application/index/static subdirectory under the module's view directory. This directory is served by the StaticRoute route type that we've created and configured earlier in chapter Routing, and all "static" pages placed here will automatically become available to site users. In the code above, we set the title for the page (line 2), then we append the typeahead.min.js file to the <head> section of the page with the HeadScript view helper (line 4). In line 9, we create a text input field where the user will be able to enter some text. We mark the input field with the typeahead CSS class. In line 12, we have the jQuery event handler bound to the "document is ready" event. This event is fired when the complete DOM tree has been loaded. In line 13, we have the jQuery selector ("input.typeahead") which selects all input fields marked with the typeahead CSS class and execute the typeahead() function on them. The typeahead() function binds the change event handler to the text input field. Once the user enters a character in the field, the handler is executed and checks the letters entered. It then displays the dropdown menu with suggested auto-completion variants. The typeahead() function takes two arguments: the name argument identifies the dataset, and the local argument is a JSON array containing the available auto-completion variants. To give the auto-completion field and its dropdown menu a nice-looking visual appearance, add the following CSS rules to your style.css file. To see the auto-completion feature in work, type the "http://localhost/typeahead" URL in your browser and press Enter. 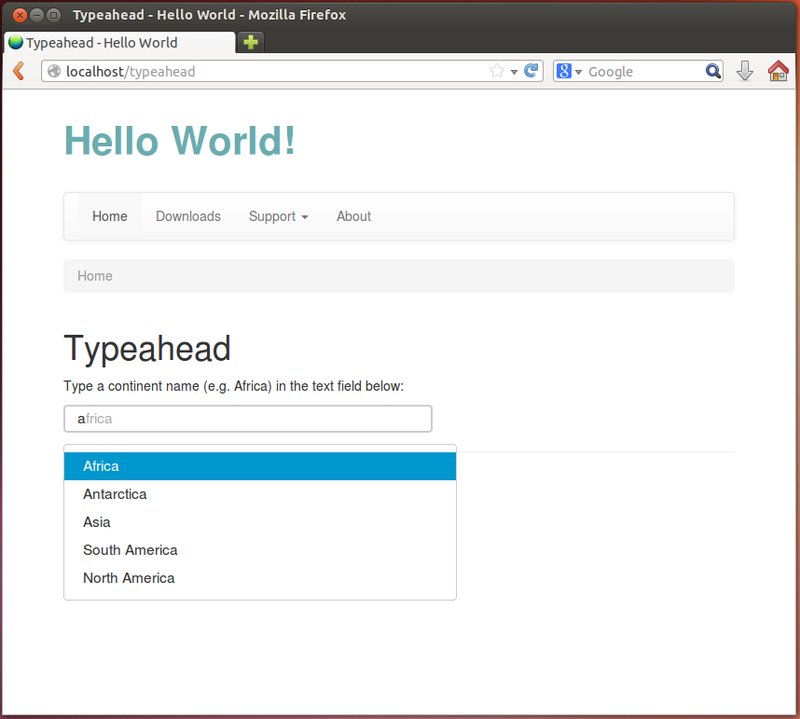 The Typeahead page will appear with the prompt to enter a continent name. For example, type a letter to see how Typeahead suggests you available variants (figure 6.7). You can see this example working in the Hello World sample bundled with this book by typing the URL "http://localhost/typeahead" in your browser.